Little Monkey Niece is sick, so we had dinner with just Mr. Monkey's brother and father at Izayoi (132 S. Central Avenue, Los Angeles). 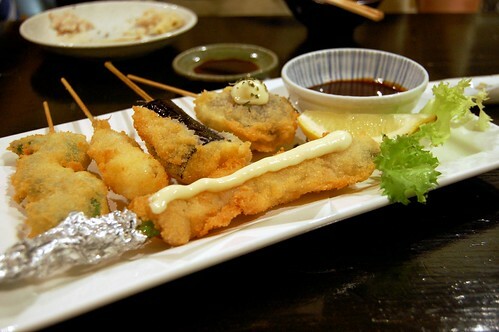 In Japan, the izakaya is a small tavern popular with the after-work set. The main focus at these places is alcohol, but they are also known for the tasty treats that accompany the booze. 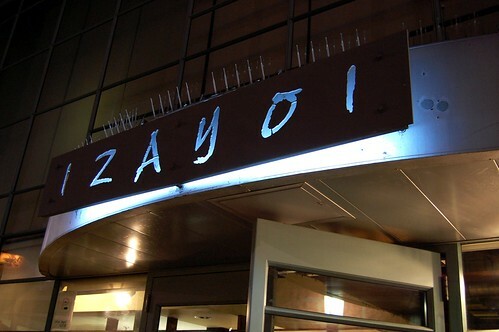 A good way to describe Izayoi is "Japanese tapas." The "snacks" at Izayoi are delectable and elegantly prepared. My only complaint is that the dishes are expensive for their small size. Needless to say, it was lovely that Mr. Monkey's father picked up the tab. 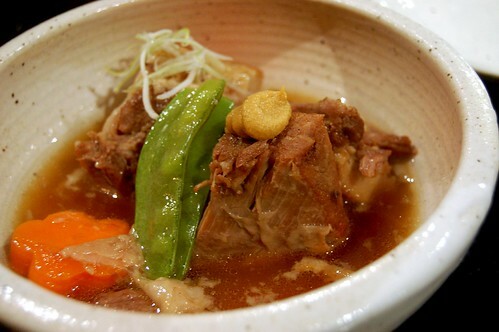 A crowd favorite at Izayoi -- buta kakuni ($8.00) -- is a most delicious tender simmered pork belly that falls apart in your mouth. The tiny accompanying dollop of spicy mustard and pool of hot broth are sublime. 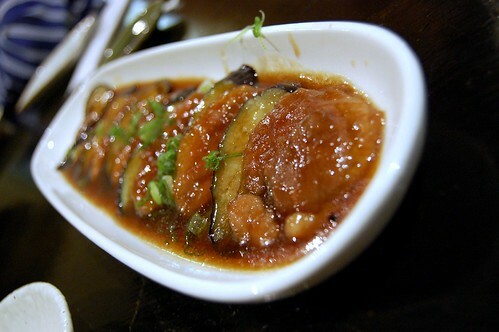 The kamonasu ($8.50), i.e., sauteed duck and eggplant, was not as good as I'd hoped. I love duck, and this dish failed to meet my expectations. The duck was slightly breaded, which just didn't feel right to me. I did like the flavor, though. I savored every succulent morsel of the gindara ($10.50). 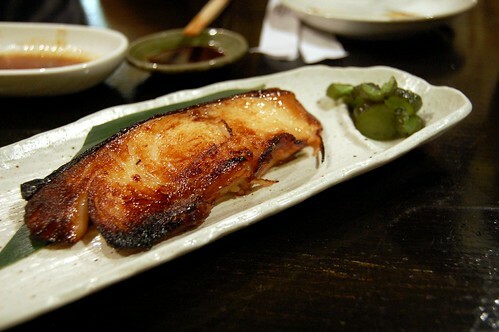 This black cod marinated in miso and sake merited its price. Excellent. 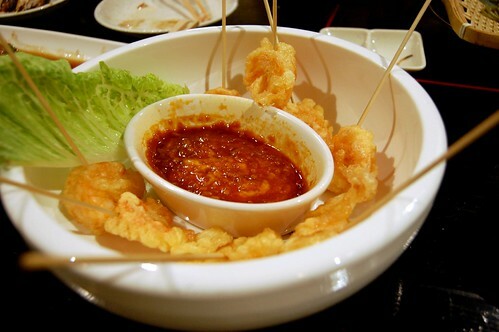 Ebi chili fondue ($9.50) is Izayoi's fancy name for shrimp tempura on sticks with chili-cheese sauce. The rich sauce has the most fabulous little kick. 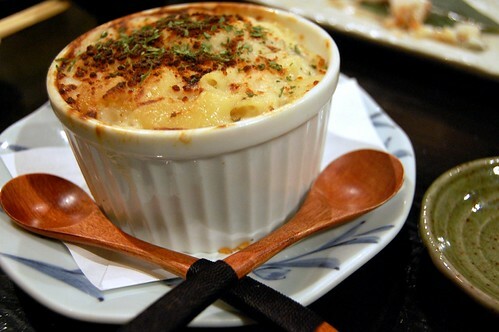 The shrimp and scallop macaroni gratin ($7.50) bubbled with golden goodness and creamy creativity. And the mini wooden spoons sure were cute. 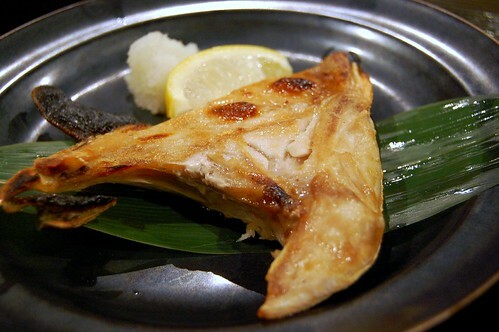 I always like hamachi kama ($14.50), although I think the cod above beat the grilled yellowtail collar this time -- a difficult feat, considering how much I like hamachi. Maybe this needed more ponzu. The fried assorted skewers special ($8.00) included shisito-leaf-wrapped shrimp, fish, pork-stuffed eggplant, mushroom, and bacon-wrapped asparagus. Yummy but nothing truly special. I could take it or leave it. Izayoi is not so easy on the wallet if you want to eat to maximum stomach capacity, but, really, who wants to waddle out of a restaurant? Choose your plates wisely, and appreciate each bite. You'll be happy you did. 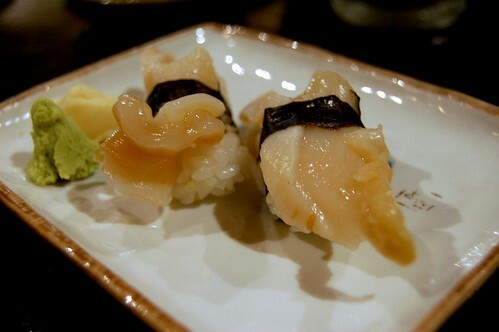 We went to an Izakaya as well this past weekend, but no geoduck on our menu. I don't think I even knew what geoduck was until Hung kept using it on Top Chef. I want that shrimp gratin. Like, right now. You had me at pork belly. my god, that looks good. Shut the front door! My husband was JUST telling me about the whole izakaya popularity last night. We were JUST saying this morning that we should find a good place to try out. This is JUST too coincidental. This whole trend is new to me. But like Liz - I'm fascinated to see geoduck on an actual menu! You need to come down to the South Bay and try Musha. Don't bother with the SaMo location. looks tasty. 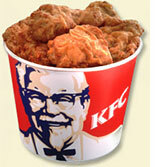 i'll have to see if Dallas has a place that serves this kind of goodness. miso-marinated anything is good in my book. I can't remember - have you been to nobu? Mmmmmm... All looks super tasty! Pork belly is my crack. So freaking jealous. The only authentic izakaya we can find around here is in NYC and yeah, you never leave with a bill under $100. Our goal for our trip in Feb. to Japan is to stuff ourselves at izakaya. "oh my want" - lmao! Mr10yt LOVES Izakaya food and always raves about it. The closest I get to it is at this place in Tustin, and my favorite dish is the potato salad...and the octopus balls (you know, octopus pieces in fried dough balls) with bonito on the top. Oh God delish. Next gtg - Izakaya!!! looks gouda. but i think i have to go on a diet. no working out and a whole pumpkin pie are not looking so hot on my mid section. Hmmmmm. Let me know when you find a cheap knock off.